The March 25 "It's show time" event will almost certainly detail what Apple's plans for its ongoing video project are, but though the general consensus believes Apple will be offering its content for free as a loss leader to sell third-party channel subscriptions, it is alleged even those channels and television networks don't know what to expect. In an investor note from JP Morgan received by AppleInsider, analysts met with numerous companies agreeing to work with Apple on the video service. It was seen that, while they are taking part, "none seemed to have a clear sense of what will exactly be announced on Monday." 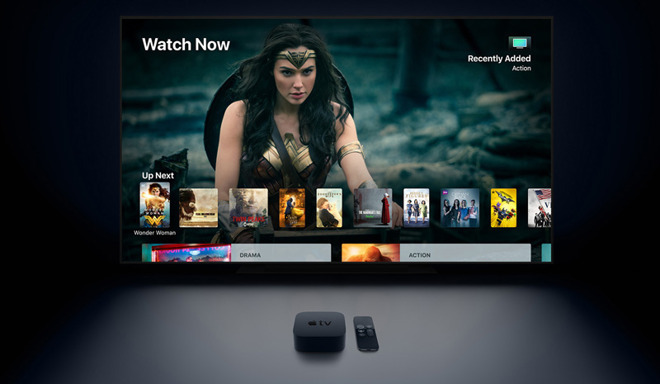 The group believed there would be free original content and channels consumers can purchase, via an app or using Single Sign-on on an Apple TV, ideas that have circulated in previous reports. On the finance side, premium networks taking part are apparently having similar terms to deals the companies made with Amazon, including the economic split and brand attribution. In effect, Apple will be paying the networks the same as Amazon would if a customer elects to subscribe. It is also suggested Apple's goal for the service will be consistent with its overall services strategy relating to subscriptions and media, in that it would take a 30-percent fee in the first year, then 15 percent thereafter. There is also the belief Apple's programming strategy is to minimize its expenditure. While Apple "is not a volume buyer" and has acquired a small amount of library content, the executives suggest Apple is instead "focused on a smaller number of prestige shows." Apple has so far spent over $1 billion on original video content production, which is relatively low compared against Netflix and Amazon, but high for what is likely to be a "free" service. It has been speculated Apple could earn considerable profits from video subscriptions, with analysts predicting revenue of $10 billion if Apple hits 100 million subscribers by between 2022 and 2024.